A few weeks ago I profiled The Washington Stock Exchange, a new site offering political junkies the opportunity to play in a special stock exchange dedicated to political probabilities. With just over two weeks remaining until election day, there have been a number of political sites emerging to better tell the election story. Constituent Dynamics offers an amazingly in depth look at the political reality. The site focuses on new polling methods to produce more accurate and predictive results. While targeted toward professional political operatives, the Majority Watch project offers an impressive look at the midterm elections that any lay-man can enjoy. 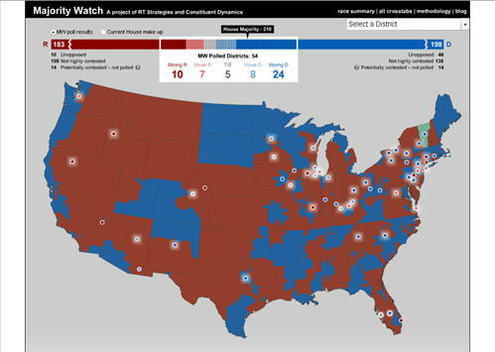 Majority Watch features updating polling data for key races, with more being added everyday plotted on a map (shown below). Similarly, Google has also recently rolled out their own election focused mashup which combines Google Earth with information about the upcoming congressional elections. If you are looking for election news, Constituent Dynamics offers more information than is offered on many mainstream news site, you can select an individual District to view demographic breakdowns and side-by-side data comparing the midterm race against the last presidential election. All said, it is an impressive site for anyone interested in politics in general, or this year's tumultuous midterm elections in particular. Of course, if you are looking for additional content and analysis, you might want to visit The Stump - AOL News Elections Blog, AOL's recently launched elections blog.